Objective: Lu-177 has a great potential for use as theranostics radiopharmaceuticals for management of cancer, evidenced by its increasing use over the past decade in nuclear medicine. The detail mechanisms of cell toxicity induced by the beta-radiation emitted from Lu-177 are not well understood. Hence, to explore the lurking mechanism of cell death, different parameters were assessed after treatment of human histiocytic lymphoma cells (U937) with Lu-177. Materials and Methods: U937 cells (1 × 106) were exposed to 3.7 and 37 MBq of Lu-177 and incubated for 24 and 48 h in humidified CO2incubator. The cell viability and apoptosis were estimated in treated and control cells by trypan blue dye exclusion and electrophoretic DNA ladder assay, respectively. Reverse transcriptase polymerase chain reaction was carried out to study the expression of anti-apoptotic genes. 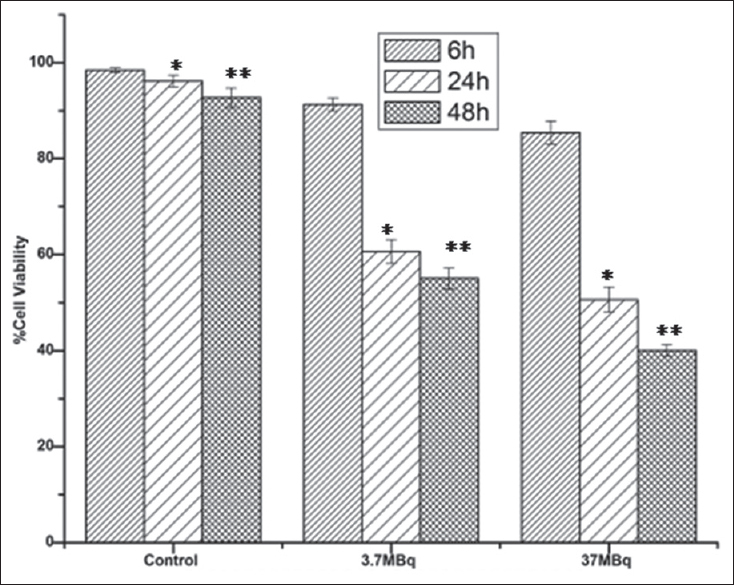 Results: It was found that the cell death and apoptosis were high in the cells which were exposed for a longer duration of time with 37MBq of Lu-177. These results were further confirmed by observation of downregulation of anti-apoptotic genes such as BCL-2 and BCLXL. Conclusion: It is concluded from the study that the Lu-177 induced apoptotic cell death in human histiocytic lymphoma cells by downregulation of anti-apoptotic genes. Conventionally, many biomarkers are being in use as a measure to genotoxicity in occupational exposure to chemicals, pesticides, radiation, and drug screening. Of which, the micronucleus assay is a preferred choice for many of those applications owing to its simplicity and rapidity. The assay methodology has evolved in cell preparations, staining, and scoring methods: from quantifying the DNA damage in mononucleated cells and binucleated cells; solid (Giemsa) and fluorescence staining (propidium iodide/DAPI); and manual and automated microscopy scoring and flow cytometry. Despite the advantages, preparation of cells with good morphology to interpret DNA damage from a different type of cells remains a challenge in particular for laboratory being the processes of developing the assay. Therefore, the aim of the present report was to explain the micronuclei (MN) assay and means to overcome the troubleshoot for reliable outcome measure using cytokinesis-arrested micronucleus (CBMN) assay from suspension and adherent cultures. The 1st International Conference on Radiation Research: Impact on Human Health and Environment (2016) and First Biennial Meeting of Society for Radiation Research was organized at Bhabha Atomic Research Centre in Mumbai (India). Recent developments in molecular, translational, and clinical radiobiology were discussed among basic and translational scientists as well as clinicians. The meeting has covered the topics ranging from the most recent insight into the paradigm shift from DNA-based radiation health effects (epigenetics), radiation biology from laboratory clinic, radiobiologically relevant redox metabolism, hypoxia, stem cell biology, hyperthermia to advances in dose deposition, and understanding the molecular biological effects of high linear energy transfer (LET) radiation. 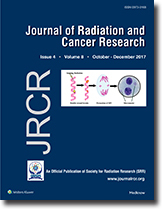 Mechanism of radiobiological effects of actinides, and the search for novel radiosensitizers, radiation countermeasures, and efficient actinide decorporation agents were discussed for further improvement in cancer radiotherapy, radiation protection, and medical management of internal contamination in humans. This report summarizes the key points of recent observations/results presented in the meeting, and highlights their importance in view of human health and environment. This document would also help in understanding the significance of synergistic interaction among radiation researchers, scientists, clinicians, medical physicists, and radiation environmentalists for harnessing the real potential of radiation/radioactivity for better care of human health and environment.